What's more a part of daily life than having to call a repairman to fix a broken pipe, kitchen appliance, or air conditioning unit. These working class, service men and women are there when we need them most to repair, install, and/or replace whatever is ailing our home and get us back to our regular routines! Our recent shoot captured one such aspect of this field as our model portrayed a handyman in a home kitchen setting. 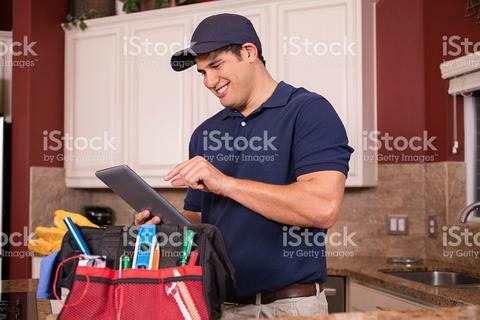 With his tool bag nearby and his digital tablet in hand, our guy is ready for any home repair need. To view more images from this shoot as well as all of our "repairman" images, click the link below. To view or download the image above, just give it a click. And remember, we continually upload images from past shoots to our portfolio, so check back often for more images from this shoot.